It’s a story that would have been all over the media if it had been a conservative, an anti-IRS activist, an NRA member, or any organization liberals think are right leaning. In early August, authorities raided a compound in New Mexico, where three women, a man, and 11 children were found in deplorable conditions. One child’s remains were also found. They were reportedly being trained by Siraj Wahhaj to commit school shootings. Siraj’s father, same name, was an unindicted conspirator of the 1993 World Trade Center bombing. To make things more controversial, the judge in the case, Sarah Backus, granted four of the five potential terror suspects to be released on bond. Siraj remains in custody since he was an outstanding warrant from Georgia regarding the alleged kidnapping of his son, who may or may not be the deceased child police found at the compound. Backus is a Democrat and known for setting low bailfor violent offenders. Jany Leveille, 35, was detained by immigration officials Tuesday and soon must appear before a judge to resolve her immigration status, which could lead to her deportation, U.S. Immigration and Customs Enforcement (ICE) officials said in a statement. “Leveille has been unlawfully present in the U.S. for more than 20 years after overstaying the validity of her non-immigrant visitor visa,” ICE said. Leveille moved to Brooklyn, N.Y., from Haiti in 1998 after her father died, Von Cehelet Leveille, the woman’s brother, told Reuters. She has moved several times since coming to the U.S., living in Georgia, Philadelphia and New York after separating from her husband, the brother said. 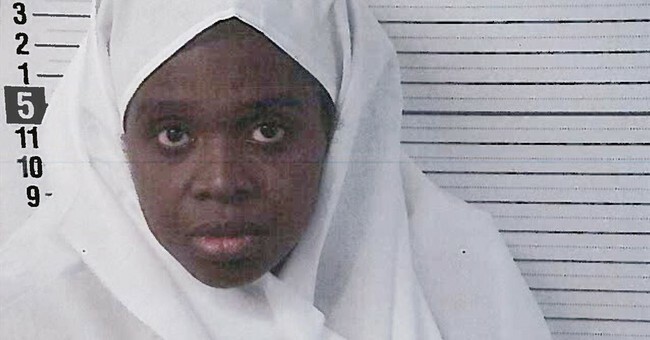 Leveille lived at the New Mexico compound with her current husband Siraj Ibn Wahhaj and their children since January, prosecutors said. She has six children, ages 1 to 15, her brother told Reuters. The children discovered at the compound earlier this month were both trained to use firearms and taught multiple tactical techniques in order to kill teachers, law enforcement officers and other representatives of institutions they found corrupt, state prosecutors said on Monday. So, for those of you wondering, yes—ICE also works to protect us from terror threats.